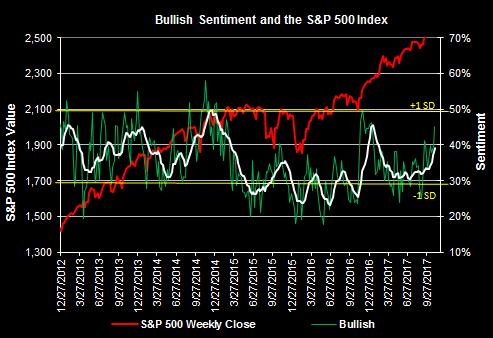 At the end of August bullish investor sentiment reached a year low of 25% and since that time individual investor sentiment has risen to 45.1% as reported by the American Association of Individual Investors (AAII) today. During this time period the S&P 500 Index has increased nearly 5%, providing some support to the contrarian nature of the individual sentiment report. "is not predictive in nature and is of little value in attempting to determine what the stock market will do in the future. The primary goal of most active managers is to manage the risk/reward relationship of the stock market and to stay in tune with what the market is doing at any given time. 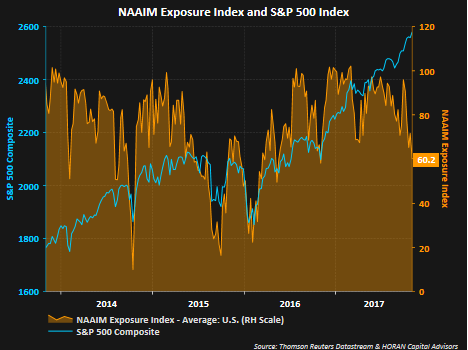 As the name indicates, the NAAIM Exposure Index provides insight into the actual adjustments active risk managers have made to client accounts over the past two weeks." Nonetheless, investment managers are positioned for a less constructive bullish market while the individual investor seems more optimistic from a sentiment perspective. One should keep in mind these sentiment measures are most predictive at extremes and it can be argued neither the AAII sentiment reading nor the NAAIM Exposure Index is at an extreme level. However, sentiment expectations for institutions and individuals are moving in opposite directions and both will not be right.